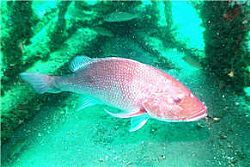 Biologists with the Florida Fish and Wildlife Conservation Commission's (FWC) Fish and Wildlife Research Institute (FWRI) request angler assistance with a research project focusing on red snapper caught in Florida offshore waters. This project will provide fisheries researchers and managers with vital catch-and-release survival information needed for assessing the status of this important recreational fishery. FWRI biologists will approach anglers at public areas along the Gulf coast of Florida, including boat ramps, fishing piers and marinas, to request participation in the study. These biologists will distribute survey cards designed to collect detailed information on fishing trips targeting red snapper. This information includes where red snapper are caught and released, the type of fishing equipment used, and the condition of the fish when released. The data will provide vital information that will help improve the management of this popular recreational fishery. Anyone fishing for red snapper in Florida can also request a postage-paid survey card in the mail, by emailing their name and address to FishStats@MyFWC.com. To download a data sheet, visit MyFWC.com/Research/Saltwater; click on "Recreational Fisheries" and select the article "FWC Enlists Anglers to Assist Reef Fish Studies." In addition to completing survey cards, anglers, vessel captains and mates can assist with reef fish research by reporting tagged fish to the Angler Tag Return Hotline at 800-367-4461. Since 2009, FWRI biologists have been tagging and releasing reef fish back into the Gulf of Mexico in an effort to evaluate the survival of fish caught and released with hook-and-line recreational fishing gear. Previous studies estimate that approximately 60 percent of red snapper survive when released after being caught on hook-and-line. A similar tagging program began this year on the Atlantic coast. By reporting tagged fish, anglers will help to improve the accuracy of estimated release survival rates for this species. For this project, biologists are inserting yellow or orange tags near the dorsal fin of the fish. Each tag has a unique number printed on the side. When reporting a tagged fish, anglers should provide the species of fish, tag number, date and time of capture, where the fish was caught, fish length, type of bait used and whether the fish was kept or released. If the fish is released, anglers should leave the tag in the fish so biologists can continue to collect data. For more information on this and other recreational fisheries research surveys, visit MyFWC.com/Research/Saltwater and click on "Recreational Fisheries."